Oh Yes I Can is the second solo studio album by Crosby, Stills, Nash & Young member David Crosby. It was released on January 23, 1989, 18 years on from his previous solo release, If I Could Only Remember My Name. Four songs ("Drive My Car", "Distances", "Melody" and "Flying Man") had been slated to appear on Crosby's unfinished 1979-1981 Capitol Records solo album and were subsequently rejected for inclusion in Crosby, Stills & Nash projects. The group had previously attempted to record "Drive My Car" and "Distances" during aborted 1978 sessions for a follow-up to CSN (1977). The hitherto unreleased "Drop Down Mama" was an adaptation of a Sleepy John Estes song that was previously recorded by David and the Dorks (a short-lived ensemble including Crosby and members of the Grateful Dead) in 1970 and Crosby & Nash with The Mighty Jitters circa 1975-1976. Producers – David Crosby; Craig Doerge and Stanley Johnston (Tracks 1-7, 9, 10 & 11); Howard Alpert and Ron Alpert (Track 8). Engineers – Stephen Barncard, Steve Gursky, Stanley Johnston, Gerry Lentz and Jay Parti. Assistant Engineers – Tom Banghart, Gary Boatner, Michael Bosley, Troy Cruze, Larry Goodwin, Scott Gordon, Mark McKenna, Russell Schmidt, Allan Tucker, Bob Vogt and Paul Winger. Mixing – Niko Bolas (Track 1); Stanley Johnston (Tracks 2-11). Mastered by Bob Ludwig and Mike Reese at Masterdisk (New York, NY) and A&M Mastering Studios (Los Angeles, CA). Photography – Henry Diltz (back cover), Jay Parti (front cover) and Aaron Rapoport (inner sleeve). ^ Lindsay Planer (1989-01-23). 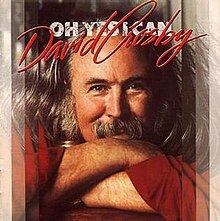 "Oh Yes I Can - David Crosby | Songs, Reviews, Credits". AllMusic. Retrieved 2015-12-21. ^ Browne, David (23 March 1989). "David Crosby: Oh Yes I Can : Music Reviews : Rolling Stone". web.archive.org. Archived from the original on 4 March 2008. Retrieved 18 September 2011. This page was last edited on 17 February 2019, at 16:29 (UTC).